News: Scotland to appoint interim coach? News: Who will be the next Scotland coach? 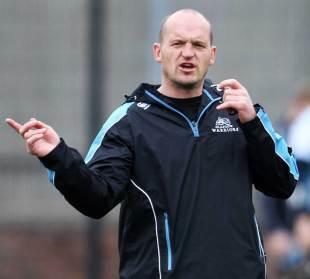 Glasgow Warriors boss Gregor Townsend has distanced himself from the vacant Scotland coaching job and wants to remain focused on his task with the RaboDirect PRO12 side. Andy Robinson stepped down as Scotland boss on Sunday after their disappointing 21-15 loss to Tonga in Aberdeen. This followed a poor 2011 World Cup campaign and a 2012 Six Nations tournament that ended up with Scotland suffering the ignominy of being the Wooden Spoon holders. Townsend was assistant to Robinson, as attack coach, until the end of the Six Nations, before he was this summer appointed Glasgow head coach in place of Sean Lineen. And he has flourished at the Warriors, leading them to third in the PRO12. "My focus is firmly on Glasgow Warriors. I know I have a lot of work to do to improve as a coach," Townsend told BBC Scotland. "I'm enjoying this opportunity and I'll give it as much as I can to make the team successful. "I spoke to Andy on Sunday and he is comfortable with his decision and keen to get back into coaching. I worked with him for three years and learned so much from him. He's a fantastic coach and I know he put everything into the job with Scotland." Townsend was replaced by Scott Johnson in the Scotland set-up and the Australian has since been linked with the interim coaching spot, along with former Warriors coach Lineen. When Robinson relinquished his Scotland post, he claimed that the team has plenty of potential and Townsend agrees with this view. "It's disappointing that we were not able to kick on from the summer tour, but we are not far away," Townsend added. "We have some very good rugby players, but we have not been able to produce an 80-minute performance this autumn. "We've been close to getting it right for a while. I was involved at the World Cup and we had two defeats in the last two or three minutes of games, against Argentina and England. We've been competitive, but we've not had the run of results the team is capable of. Whoever takes over will inherit a hard-working bunch of players that are desperate for success."